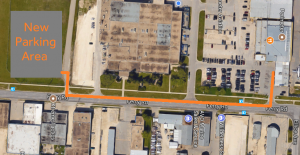 Limited free parking is available at our Winnipeg terminal (626 Ferry Rd) for a maximum of 2 weeks. A valid parking pass must be displayed on your dash or rearview mirror; otherwise the vehicle will be towed at the owner’s expense. Parking passes can be obtained from one of our Winnipeg Customer Service Agents at the time of check-in. Please keep in mind that parking is limited and space is not guaranteed. 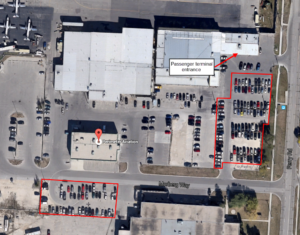 The following maps clarify the three parking lots that are available for customer parking in Winnipeg, MB. Please do not park in any other Perimeter parking lot, or in any designated “No Parking”, or “Reserved” areas, or the vehicle will be towed at the owner’s expense. Note: If no parking is available at Perimeter, customers may need to explore other parking options.